What do full sun, 91 degrees, and buzzing bees have in common? Blueberries!! And yet, as one who is not fond of heat and extremely not fond of bees, I found picking blueberries to be beautiful, pleasurable and meditative. 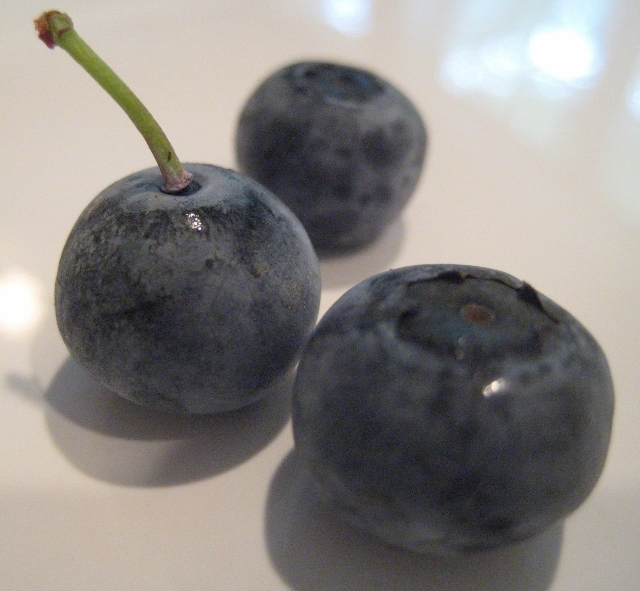 We are fortunate to have a blueberry farm (Blueberry Hill U-Pick) nearby. It is on one of those long country roads that several of us have stories about – getting terribly lost in the days before GPS in the car and ubiquitous cell phones and thinking we would never find civilization again. It is interesting to work side-by-side with the bees, both focused only on the sweet berries. The fruit-filled bushes themselves are beautiful – I have a nice picture but I can’t figure out how to get it downloaded from my cell phone. Note to self: bring real camera next time. We froze quite a few blueberries last summer, and they lasted most of the winter for use on cereal or in muffins. I used the following method to yield individual frozen blueberries: rinse, dry, and lay out in a single layer on a cookie sheet or pan (one with a rim, as blue berries are roly-poly), freeze (it takes a few hours), then store in bags or containers.